Originally Show #19, Air date: 7. 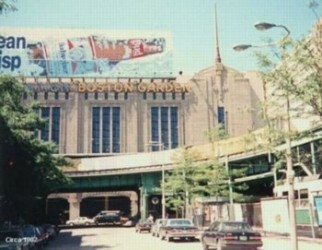 August, 2004 – The Boston Garden was a great place to see a concert. It was built at the cost of 4 million dollars in 1928 by the same people who built New York’s Madison Square Garden. It was originally called Boston’s Madison Square Garden and eventually “Madison Square” was dropped from the name. The Garden was demolished in 1997. Today, everything in the photo to the right, is gone. The Floyd live at The Garden, 18. June, 1975. Most enjoyable are the performances of You Gotta Be Crazy, which is different from both the 74 and 77 Dogs versions. The set also has very good versions of Any Colour You Like and one of the last pre-87 performances of Echoes. This entry was posted in 1975 Wish You Were Here Tour by Doc. Bookmark the permalink. Only recently discovered your podcast. Just listening to this now. Awesome. Thank you! You’re welcome and welcome aboard!